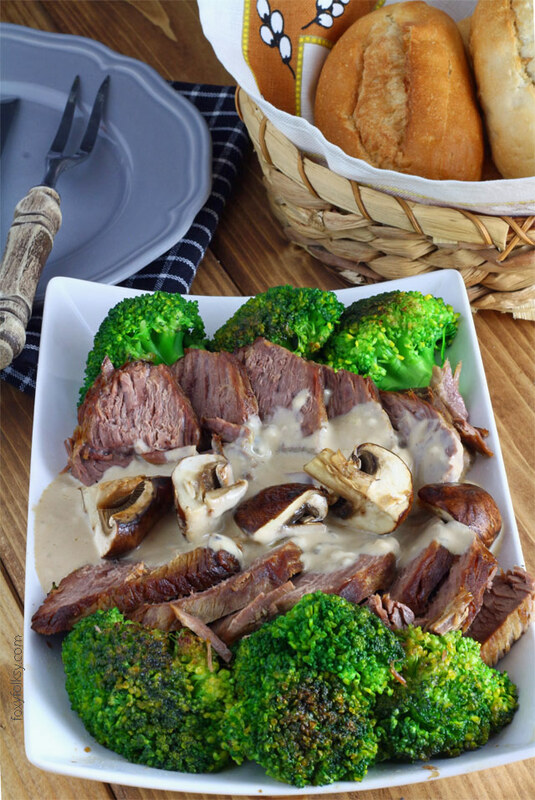 This recipe of Roast beef with cream of mushroom sauce is pot roasted. The beef is so tender and juicy and really simple to make. When my parents still have their canteen, their bestseller dish, next to sisig, was their roast beef. This is also one of the most requested dishes when we are having a gathering. 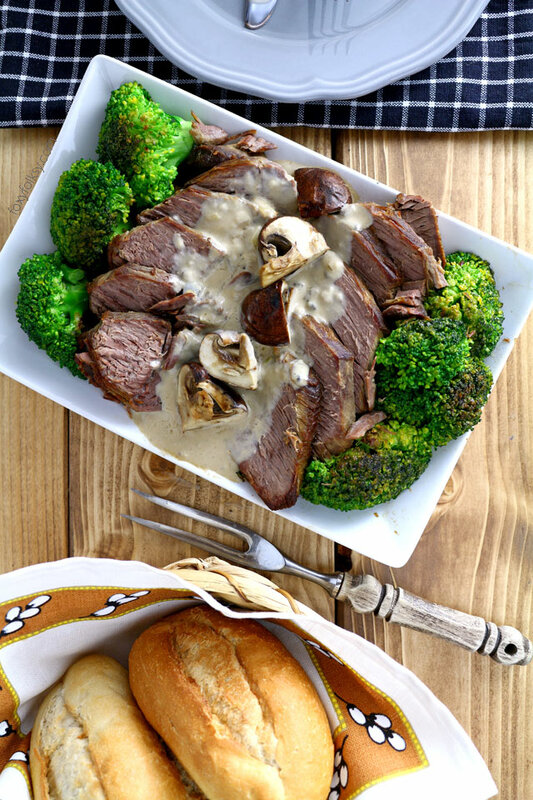 Usually, when my Mama makes this, the beef is almost swimming in mushroom sauce, but I wanted to show the beautiful color and texture of the pot roast beef in the photos so I resisted the urge to do the same. After pot roasting the big chunks of beef, they are then cut into thin slices and placed back to the pan where the mushroom sauce will be added and simmered a bit more so the flavor would seep in. I, personally, find that this process of post roasting is better for beef than oven roasting. Because you can make sure that you get a tender meat after roasting without spending a small fortune for prime cuts of beef. From what I gathered from Christine Gallery in her article about pot roast in the Kitchn, the ideal cuts/parts for pot roasts are chuck, brisket, and round. 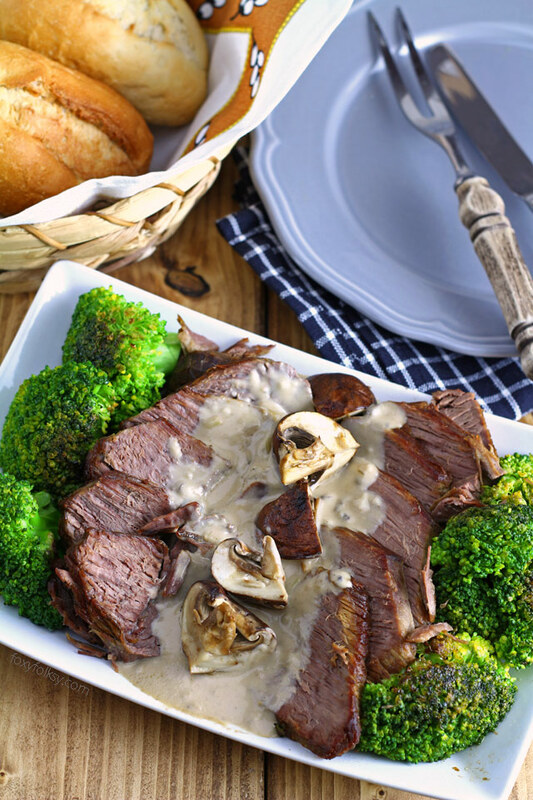 This recipe of Roast beef with cream of mushroom sauce is pot roasted. 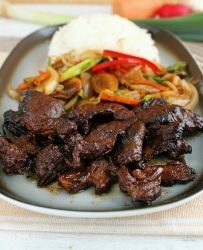 The beef is so tender and juicy and really easy to make. Heat oil in a skillet over medium-high heat then add the roast then cook until golden brown on all sides, about 8-10 minutes, turning as needed. Transfer roast to a pot, sprinkle salt and add the peppercorn then fill the pot with water, enough to cover the roast and then some more. Cover with lid and then bring water to boil. Once it boils, lower heat to lowest and let it cook for several hours until meat becomes tender (2 hours minimum). Cut meat into thinner slices. In a skillet, saute garlic in melted butter until limp. Add the mushrooms and cook until both garlic and mushroom are slightly browned. Pour the cream of mushroom and all-purpose cream. Season with soy sauce and ground pepper. Let it simmer for some minutes. If the sauce becomes too thick, add some of the beef broth. Add the slices of beef to the sauce and let it simmer for 10 minutes. The sauce in this recipe is good enough for 1 kilo of beef. Serve it with your favorite roasted veggies or with rice. an approval from a Kabalen, when it comes to cooking, means a lot to me! Thanks Rica!